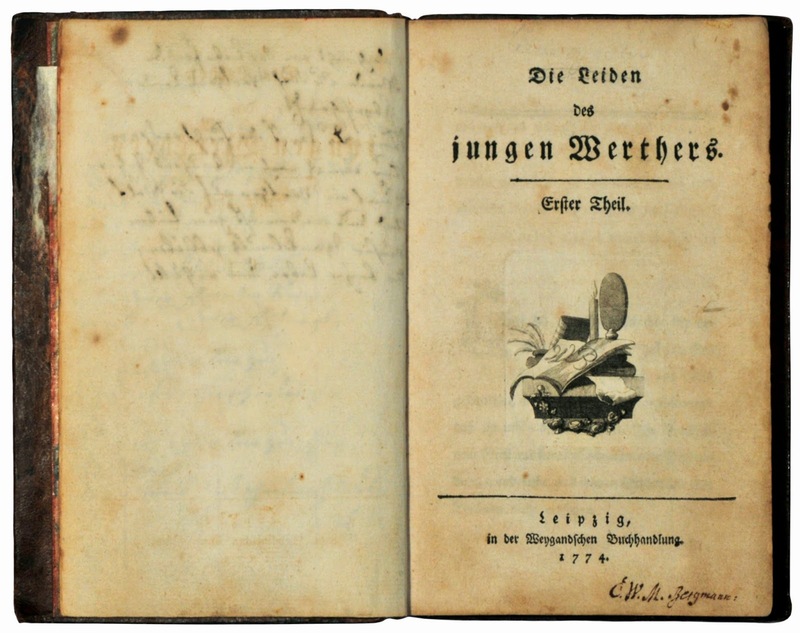 In 1774, Goethe published the novel The Sorrows of Young Werther. The novel consists of a series of letters from a young, sensitive artist by the name of Werther. Over the course of these letters, we learn that Werther has become involved in a tragic love triangle. He believes that in order to resolve the love triangle, some member of it will have to die. Not being inclined to commit murder, Werther resolves to kill himself. This he duly does by shooting himself in the head. Goethe’s novel famously led to Werther Fever. Young men, perhaps attracted to the melancholic and tragic qualities of Werther’s life, started to dress in the style described in the novel and adopt the mannerisms of the character. Some even went so far as to kill themselves, just as Werther had done. They were the first modern examples of “copycat” suicides. Suicide is a prevalent and persistent feature of human society. According to the WHO, approximately 800,000 people per year commit suicide. Many view this as a serious social (public health?) problem. Others may be less sure. In this post, I want to give a very brief overview of some of the key questions and ethical frameworks one can apply to this difficult topic. This is not intended to be a defence of any particular view, nor a comprehensive summary of the arguments for and against the permissibility/forbiddenness of suicide. It is merely intended to raise some relevant questions and provide a structure for thinking about the issue. I base most of what I say on Thomas Hill Jr’s article “Killing Ourselves”, which appeared in the Cambridge Companion to Life and Death. I know there are better works out there on the philosophy of suicide — Michael Cholbi’s book springs to mind — but this was the one I read most recently. Please note that this post will only barely touch upon the topic of euthanasia and assisted suicide. Suicide: Is the intentional and voluntary taking of one’s own life. At first glance, this is a simple and appealing definition. It seems to capture the core phenomenon of self-killing pretty succinctly. There are, however, all sorts of cases that would test the limits of this definition. Consider the “voluntariness” requirement. Many people may take their lives under conditions of coercion, duress or necessity. Does that mean they don’t commit suicide? Take the example of Hitler. He killed himself in order to avoid the humiliation of execution. Was his decision voluntary? What of the Japanese Samurai, who had a form of ritual self-killing (known as seppuka or hari-kari) that they used to “die with honour” rather than fall into the hands of their enemies? Or the soldier who throws himself on a grenade in order to save his comrades? I suspect we would say that each of these counts as an example of “suicide”, but depending on how we understand the voluntariness condition, they may not meet the conditions set down in our definition. Harder issues arise when we consider the relationship between responsibility and suicide. Hill uses the example of the Christian martyrs and Socrates to illustrate this point. The early Christian martyrs were given the option of renouncing their Christianity or being fed to the lions. In choosing the latter, they chose their own death, but we would hardly say that they “committed suicide”, would we? Others were responsible for their deaths; they should take the blame. Or what about Socrates? He drank hemlock and thereby killed himself, but he had previously been sentenced to die by the Athenian government. Does that count as a suicide? (Admittedly, the judgment in Socrates case is clouded by the fact that he had the option of exile too). The point is that describing an act of self-killing as “suicide” is not always straightforward. This has knock-on implications for the ethics of suicide. The ethical assessment of the Christian martyrs is likely to be very different from the assessment of Hitler. This is something that should be borne in mind. In his discussion, Hill suggests that we focus on paradigmatic cases of voluntary and intentional killing first, and then expand our analysis to cover the borderline cases. I’m not so sure that this will work if we include the voluntariness requirement — since that is a highly controversial concept — but it might work if we dropped it. A. The Competency Question: Was the person mentally competent and sufficient rational and self-governing to be responsible for the act of self-killing? I think this is possibly the most important question. In many cases, the default assumption is that the person who commits suicide lacks mental competency or rationality. Indeed, the act of killing oneself is often taken to be conclusive evidence of this. People don’t accept that the reasons typically stated for suicide (feelings of hopelessness etc.) can be embraced by the rational mind. That this is the default assumption seems to be proven by the fact that people only accept the rationality of suicide in certain extreme cases, e.g. terminal illness, self-sacrifice to a greater good. The thought of a rational, fully competent adult, who faces nothing more than the ordinary slings and arrows of outrageous fortune, ending their lives is too much countenance. Such an individual must be mentally or rationally deficient. I’m not entirely convinced by this default assumption. This is for two reasons. First, it’s not clear to me that, say, a nihilistic worldview which holds that all lives are meaningless and devoid of hope, is all that irrational. To be clear, I don’t accept this worldview and I have argued against it in the past. Nevertheless, it doesn’t strike me as being significantly more irrational other philosophical commitments that we are we don’t judge in the same way (say: moral anti-realism or epistemic internalism). If a person can competently and rationally embrace those views, why can’t they competently and rationally embrace nihilism? The other reason for rejecting this default assumption is more controversial. The competency question is asked is because it is thought to be a necessary precondition for a more interesting debate about the morality of suicide. The idea being that only a fully competent person could commit suicide in a permissible way. But I wonder whether this is entirely true. One of the most interesting student theses I read in recent years argued that, in certain cases, it was permissible for those suffering from incurable mental illnesses to kill themselves. Now, that could be interpreted as an argument in favour of the competency of such individuals, or as an argument in favour of permissibility despite a lack of competence. If it’s the latter, we might have reason to challenge the importance of competency question. B. The Deontic Question: Is suicide ever permissible, forbidden or obligatory? This raises related questions, such as: Do we have a right to commit suicide? Should we try to prevent suicide? And so on. This is the question that motivates the different ethical frameworks outlined below. I’ll say no more about it here. C. The Axiological Question: Even if suicide is permissible, does it fall short of the moral ideal? The idea behind this question is that actions can often be permissible without being ideal. For example, I think it is permissible to take recreational drugs, but I don’t think this is always morally ideal. I think certain kinds of drugs may prevent you from achieving other, more important, moral and personal goals. Might something similar be true of suicide? Obviously suicide prevents us from achieving certain future personal and moral goals, but that doesn’t necessarily mean it couldn’t help us achieve others (in certain limited cases). There is, consequently, a possibility that suicide is morally ideal in some cases. Thus, the question of moral ideals is an important one. D. The Assisted Suicide Question: Assuming that it is, occasionally at least, permissible to kill oneself, is it ever permissible to help another to end their own lives? This is the question that seems to dominate the contemporary debate, with the focus being on those with terminal illnesses who genuinely seem to want to end their own lives, but are not in a position to do so safely by themselves. We’ll say no more about it here. The focus in the remainder of this entry is on the second and third questions. In his essay, Hill proposes four different frameworks for thinking about the ethics of suicide: the theological framework; the libertarian framework; the consequentialist framework; and the Kantian framework. I’ll run through each briefly. The theological framework, as the name suggests, bases its ethic of suicide on theological premises. The typical theistic view being that either (a) life is a gift from God that we cannot revoke; or (b) we are God’s property/creation and in choosing to end our own lives we would violate his authority over us. This means that suicide is always and everywhere ethically wrong. This theological view can be grounded in different ways. Scripturalists will search for some revealed text that endorses this view; natural lawyers will argue that it follows from a proper appreciation of the telos of human life. The theological view dominated Western thinking about suicide for centuries. It is, however, vulnerable to many objections. Most obviously, if one is not a theist, one is not going to accept it. But even if one is a theist, there are problems. Is it really true that scripture or natural law supports the prohibition against suicide? These things are always open to doubt. Famously, David Hume argued that a theist could accept the permissibility of suicide in his essay Of Suicide. The libertarian framework is based on libertarian moral and political theory. Libertarians typically believe that we have a natural right of self-ownership, i.e. ownership over our bodies, our labour and the fruits of our labour (the latter being particularly controversial). As such, we have legitimate and total authority over these things: we can do with them as we please. A permissible attitude toward suicide follows from this. If we choose to end our lives, that is our right. Although the associated political philosophy is not always my cup of tea, the libertarian view on suicide strikes me as being the most plausible. But, just to be clear, this doesn’t imply that suicide is morally ideal or something we should care nothing about. Likewise, the libertarian attitude does not make quality of life irrelevant to the issue of suicide. For any individual choice, future quality of life may be the decisive factor in determining the prudential rationality of suicide. But, at the same time, that doesn’t mean one doesn’t have the right to choose as one sees fit. The consequentialist framework looks to the potential consequences of suicide to determine whether it is forbidden, permissible or obliged. Given that consequences vary with the context, the consequentialist attitude toward suicide also varies greatly: sometimes it is permissible, sometimes it is forbidden, sometimes it is obliged. If one is an act-consequentialist, this variation can occur with each and every individual act; if one is a rule-consequentialist, the variation is less striking (the question then is: what default rule would produce the best consequences across a whole life or a whole society?). The consequentialist view allows you to take into account a whole range of factors when determining the permissibility of suicide, including the impact on others and one’s prospective quality of life. It really just depends on what kinds of consequences are deemed positive or negative by the particular consequentialist theory. Traditional hedonistic utilitarianism focuses solely on pleasure and pain; more modern “objective list” theories cast the net more widely. The big problem for all consequentialist theories is that they can lead to counterintuitive conclusions. Examples abound. For instance, if killing an innocent person would help to avert mass social unrest and upheaval, then it seems like the consequentialist should do it. This is despite the fact that the innocent person has done nothing to deserve this treatment. These counterintuitive results would seem to carry over to the suicide case. Thus, if my death could help to avoid some disaster, then as a consistent consequentialist I should probably kill myself. This is irrespective of whether I want to die, or whether my future life would be a happy one. For many, these counterintuitive implications render consequentialism unusable. But there is, of course, a much deeper debate to be had on this score. The fourth and final framework for thinking about suicide is the Kantian framework. This is a non-consequentialist approach, focusing on our duties towards ourselves and others, and appealing to the concept of dignity. I have never been a fan of this concept of dignity — I find it much too mysterious and nebulous to be of any use — but the rough idea is that every human being possesses an unconditional and incomparable worth. We must respect that worth in all our actions, never treating the individual as a means to an end but always as an end in themselves. The Kantian view is usually thought to imply that suicide is impermissible. This certainly seems to have been Kant’s own view. The simplest argument for this is that killing oneself is incompatible with respect for one’s dignity: it denies the unconditional and incomparable worth of your life. It may also require treating your life as a mere means to an end. How much good can I get out of this life? If the future good is likely to be outweighed by the bad, should I just pack it in? If you are asking questions like that, you are treating your life as a mere receptacle of value, not as an end in itself. Hill has a much longer discussion of the Kantian framework in his article. I won’t get into it here except to note that he thinks that even a Kantian could embrace the permissibility of suicide in specific cases. He mentions three: (i) where one’s future life will involve a complete loss of rational autonomy due to some degenerative disorder (rational autonomy being an essential precondition for Kantian moral reasoning); (ii) where it helps to avoid gross irremediable pain; and (iii) where it is the only way to avoid a future that is degrading and contrary to one’s deepest values. An example of the latter might be the samurai who commits ritual suicide in order to avoid capture by his enemies. The idea being that capture by one’s enemies is not compatible with his deepest values. I’m not sure about these three examples myself, particularly the second, but then again I’m not sure about the Kantian framework either. That brings us to the end of this post. To reiterate the point made at the outset: nothing in this post was intended to provide a definitive argument in favour of any particular view. The goal was to provide a set of tools for thinking about this issue. Hopefully, that goal has been achieved. You should now have a sense of what suicide is, what questions should be asked about it, and how different moral views perceive it. I want to conclude with some observations about suicide and the effect it may have on others. As Hill emphasises in his article, the effect on other people is always relevant when determining the ethical status of suicide. For the theist, the effect on God and one’s relationship with God is all-important: if one damages that relationship, or violates God’s rights, one should not commit suicide. For the libertarian, the rights of others and the duties one owes to them may count against the permissibility of suicide. For instance, a parent’s caregiving duties toward their child would seem to block the permissibility of suicide. The same is clearly true for the Kantian. And for the consequentialist, the negative impact on others can also provide a compelling reason not to commit suicide (though, at the same time, the consequentialist must also accept that positive impacts on other may provide reason to commit suicide).